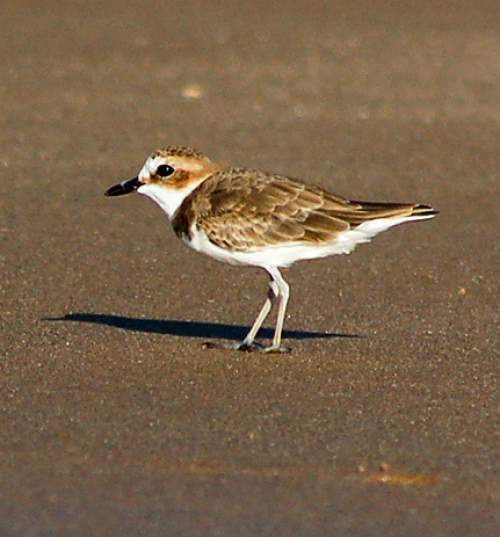 The long-billed plover (Charadrius placidus) belongs to the family Charadriidae under the order Charadriiformes. The family Charadriidae comprises 66 species under two subfamilies, Vanellinae and Charadriinae. The family Charadriidae was introduced by William Elford Leach, MD, FRS (2 February 1791 – 25 August 1836), an English zoologist and marine biologist, in a guide to the contents of the British Museum published in 1820. The subfamily Charadriinae was also described by William Elford Leach in the year 1820. This subfamily comprises eight genera, viz., Pluvialis, Thinornis, Elseyornis, Peltohyas, Anarhynchus, Phegornis, Oreopholus and Charadrius. 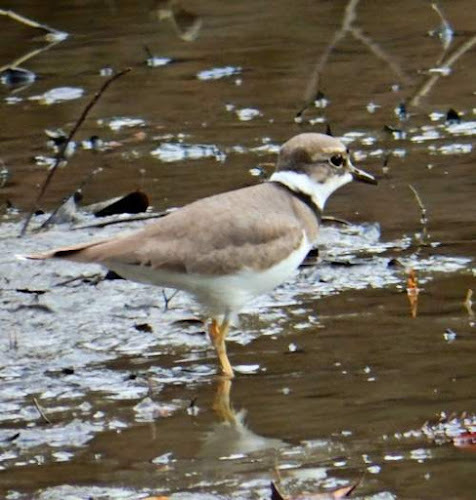 The genus Charadrius (type species Charadrius hiaticula) was introduced by Carl Linnaeus (23 May 1707 – 10 January 1778), a Swedish botanist, physician and zoologist, in the year 1758. 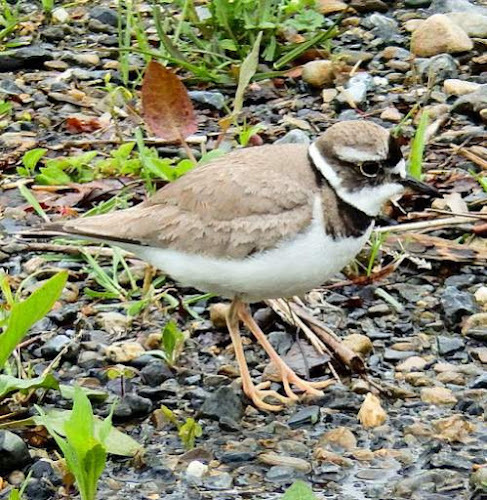 The genus Charadrius comprises 31 species, including species Charadrius placidus. 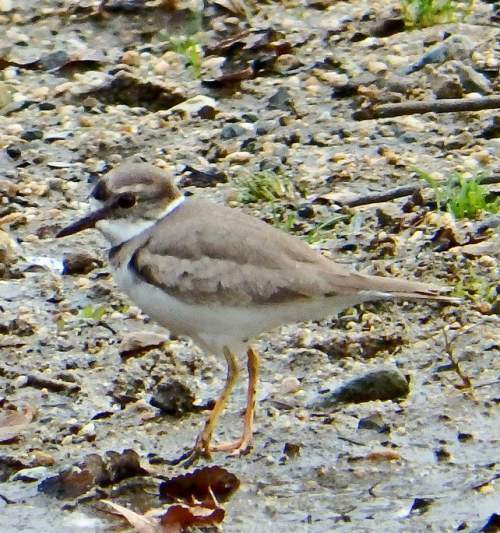 The species Charadrius placidus was introduced by Gray & Gray in the year 1863. 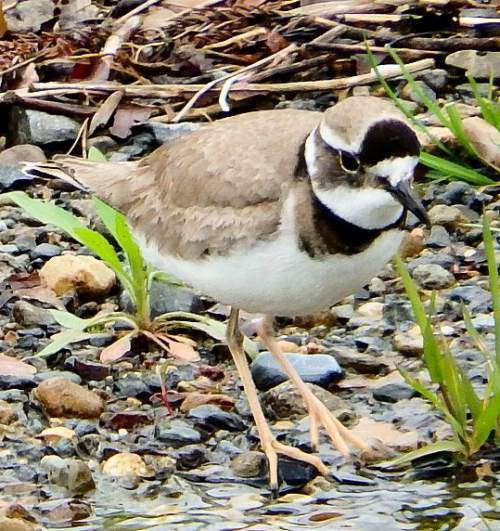 The species Charadrius placidus is monotypic. 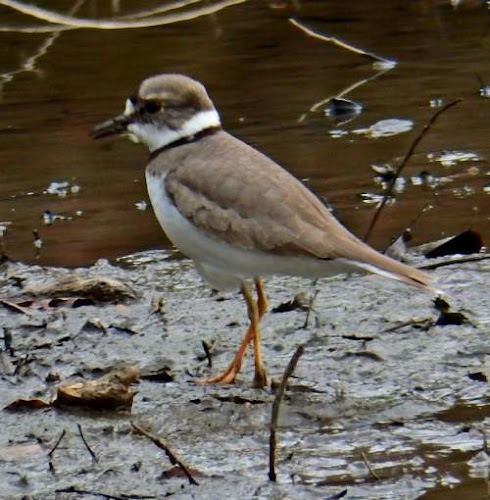 Current topic in Birds of India: Long-billed plover - Charadrius placidus images. The great spotted woodpecker (Dendrocopos major) belongs to the family Picidae under the order Piciformes. The family Picidae are a group of near-passerine birds. The family Picidae was first introduced by William Elford Leach, MD, FRS (2 February 1791 – 25 August 1836), an English zoologist and marine biologist, in a guide to the contents of the British Museum published in 1820. The family Picidae is divided into four subfamilies, viz., Jynginae, Nesoctitinae, Picumninae and Picinae. The subfamily Picinae was described by Charles Lucien Jules Laurent Bonaparte (24 May 1803 – 29 July 1857), a French biologist and ornithologist, in the year 1838. The subfamily Picinae comprises 31 genera, including genus Dendrocopos. The genus Dendrocopos was first described by Carl Ludwig Koch (21 September 1778 – 23 August 1857), a German entomologist and arachnologist, in the year 1816. The genus Dendrocopos comprises twelve species including species Dendrocopos major. The species Dendrocopos major was first described (as Picus major) by Carl Linnaeus (23 May 1707 – 10 January 1778), a Swedish botanist, physician and zoologist, in the year 1758. The species Dendrocopos major is polytypic and comprises fourteen subspecies, viz., D. m. major, D. m. cabanisi, D. m. brevirostris, D. m. stresemanni, D. m. kamtschaticus, D. m. japonicus, D. m. pinetorum, D. m. poelzami, D. m. hispanus, D. m. numidus, D. m. harterti, D. m. thanneri, D. m. canariensis and D. m. mauritanus. Current topic in Birds of India: Great spotted woodpecker - Dendrocopos major photos. The great spotted woodpecker (Dendrocopos major), also known as greater pied woodpecker, belongs to the family Picidae. The great spotted woodpecker is distributed in Europe, Asia, Mediterranean region, northwest Africa, northeast India, China and Japan. These woodpecker species have zygodactyl arrangement of the foot. These woodpeckers are polytypic species. The great spotted woodpecker (Dendrocopos major) is a medium-sized woodpecker, measuring 20 to 25 cm in length and weighing 70 to 100 grams. The upperparts of these great spotted woodpecker are glossy bluish black. The face, ear coverts and the sides of the hinder neck are white. The males have black nasal tufts and a crimson patch on the nape. The forehead is whitish or pale buff. The throat is white. 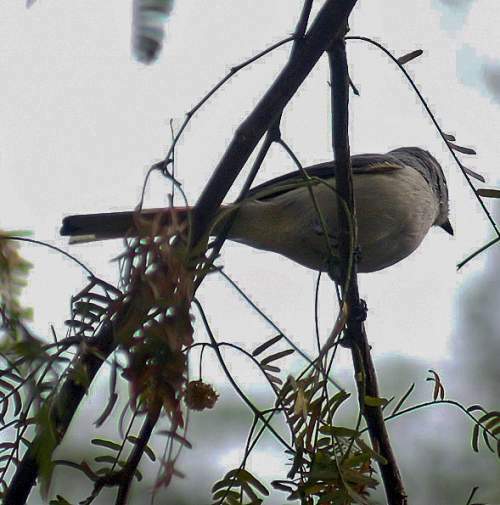 There is a large black patch on the sides of the throat and breast. This patch is connected to the bill, nape and shoulder by thick black lines. 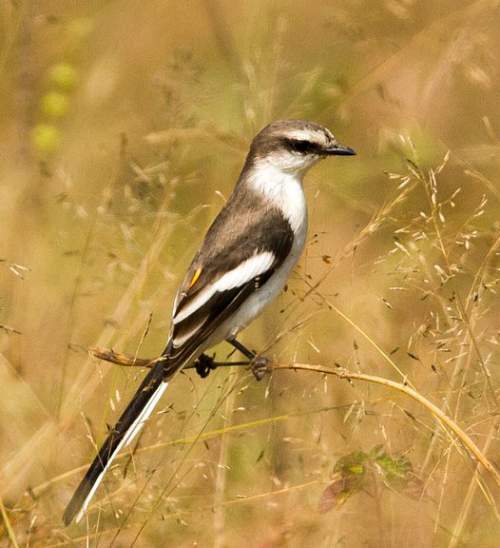 The flight feathers and the tail are barred black and white. There is a large white shoulder patch. The lower belly and undertail are red. The bill is strong and black-horn in color. The irises are dark brown. The legs and feet are gray. The talons are blackish. The call of these great spotted woodpecker species is a series of rapid, repeated "kix" or "kic" sound. These great spotted woodpecker species are distributed in Europe and Asia, with an extensive range from British Isles to Japan. 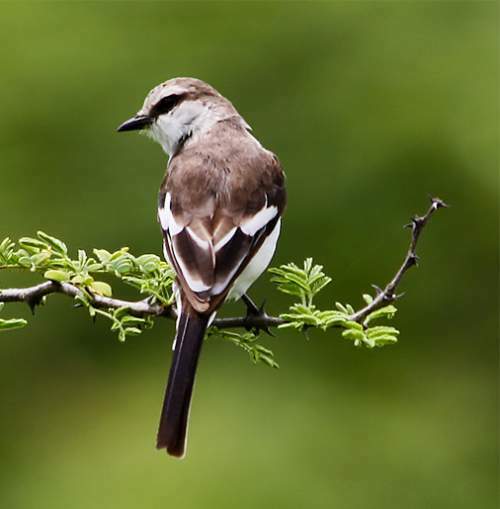 They also occur in northwest Africa, northeast India and northern parts of southeast Asia. 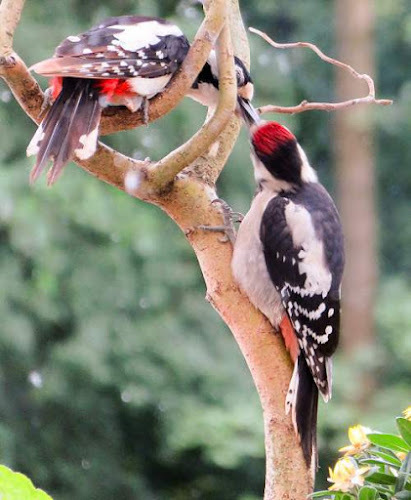 In India, the great spotted woodpeckers are distributed in the states of Arunachal Pradesh and Nagaland. In China, these species are distributed in central, southern and eastern parts. 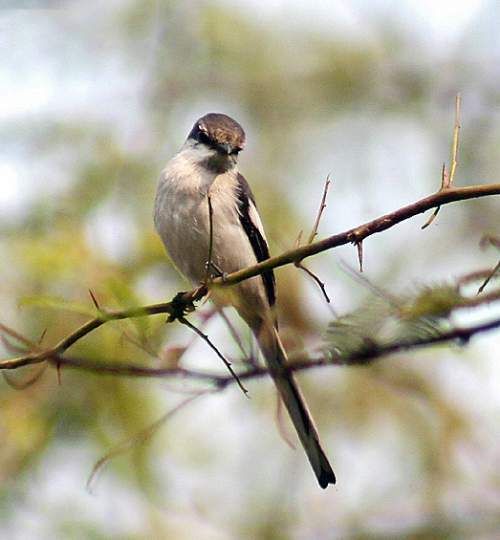 Vagrants have been recorded in USA, Gibraltar, Ireland, Faroe Islands, Iceland and Hong Kong. 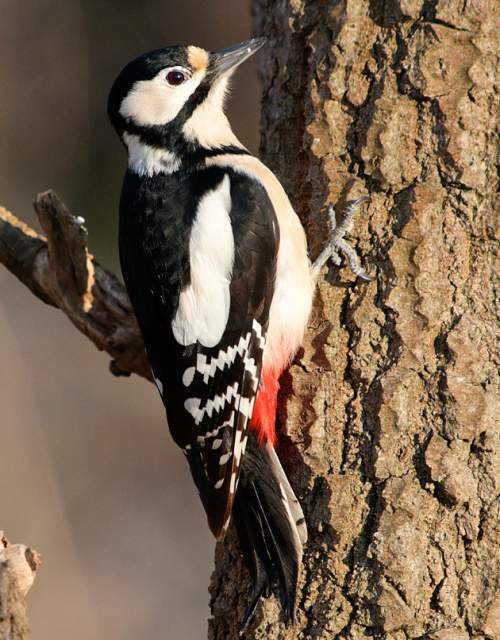 The great spotted woodpecker nominate subspecies D. m. major is distributed in the Scandinavian countries, western Russia, north Poland and north Ukraine. The subspecies D. m. stresemanni occurs in central China, northeast India, Myanmar and Yunnan (China). 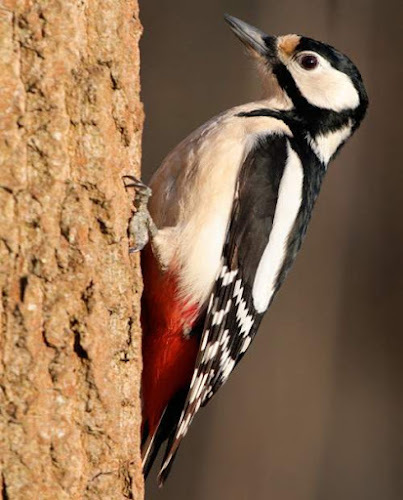 The Important Bird and Biodiversity Areas (IBA) of these great spotted woodpecker species in Spain are Vilaflor pine woodland, Tirajana pine woodland, Tauro pine woodland, Tamadaba pine woodland, Arico pine woodland, Tágara gully and Mountains of Barcelona. These great spotted woodpecker species have moderate forest dependence. They normally occur in altitudes from 0 to 2500 meters. The artificial ecosystems and habitats of these species include heavily degraded forests, rural gardens, urban areas and plantations. 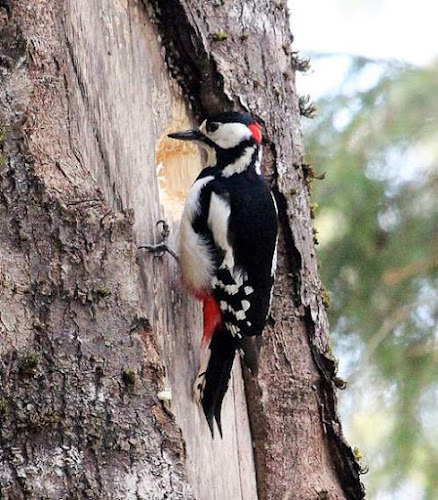 The natural ecosystems and habitats of these great spotted woodpecker species include, tropical and subtropical moist lowland forests, broadleaved forests, montane forests, boreal forests, unmixed stands of conifers and temperate forests. 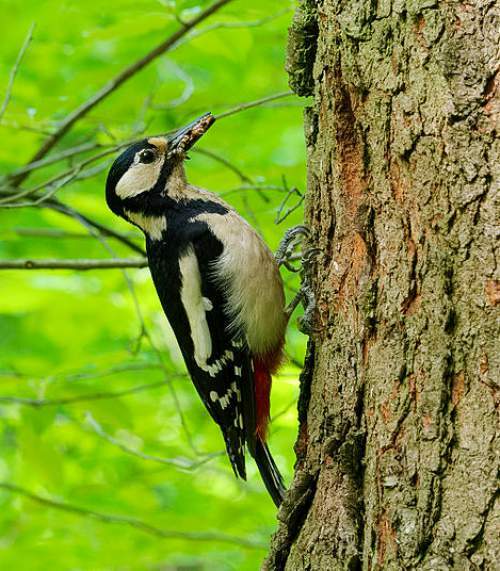 The diet of this great spotted woodpecker consists mainly of invertebrates. Wood boring insects and their larvae, other insects, crustaceans, molluscs, fruits, seeds, nuts and buds are their primary food. They are known to take eggs and nestlings of other birds. The breeding season of these great spotted woodpeckers is from April to June in most of their range. 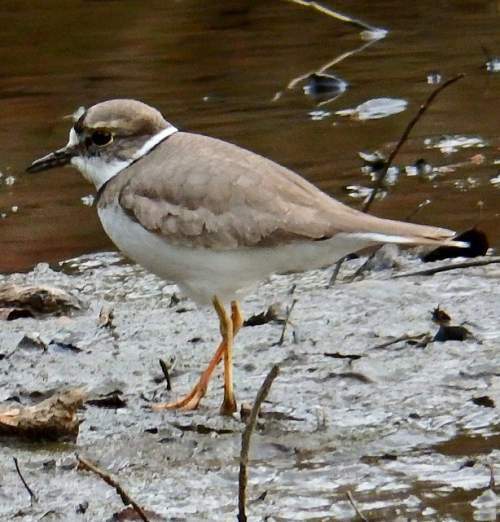 These birds are monogamous and strongly territorial. Polyandrous behavior has been recorded in some cases. The great spotted woodpecker courtship includes, flight display and spreading of tail. The breeding pair excavate a hole in a living or dead tree. 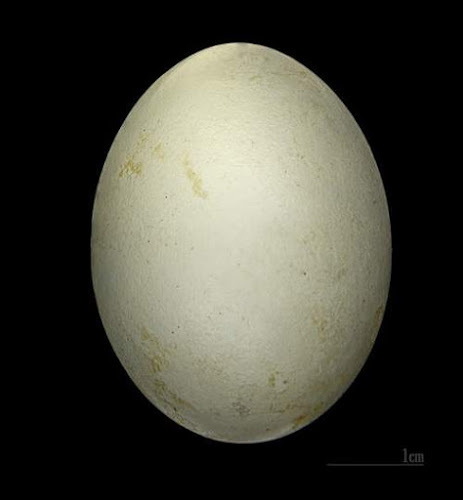 The clutch usually contains four to six white, oval eggs. The chicks hatch out after 10-12 days of incubation and fledge 22 days later. These great spotted woodpecker species are non-migrant resident birds. 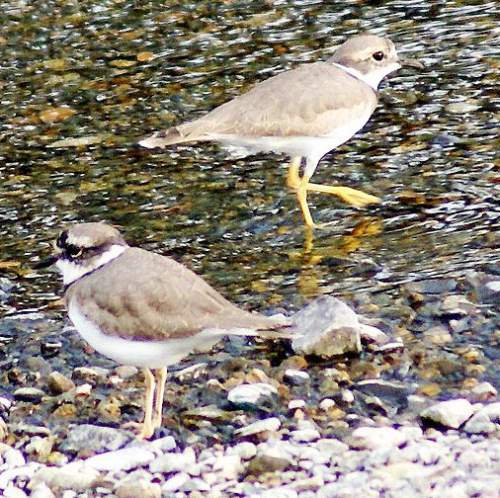 They disperse locally after breeding. Birds in higher altitudes move to lower altitudes in winter. 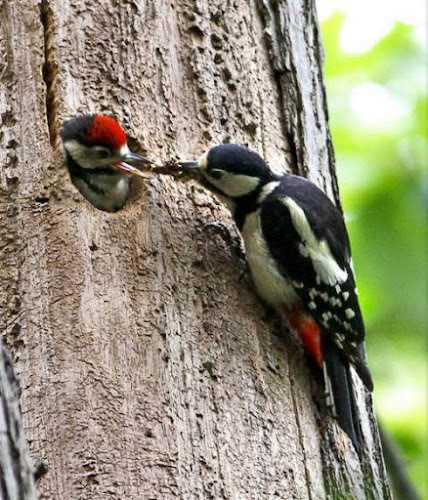 Post breeding, the juvenile spotted woodpeckers may disperse and establish in new locations within the range. Within their range they may make local movements for feeding and breeding. The global population size of the great spotted woodpecker (Dendrocopos major) is estimated to number about 73,700,000 to 110,300,000 mature individual birds. The overall population trend of the species is considered to be increasing. In most of its range, this great spotted woodpecker species is reported to be common to abundant. The generation length is 5.2 years. Its distribution size is about 57,800,000 sq.km. 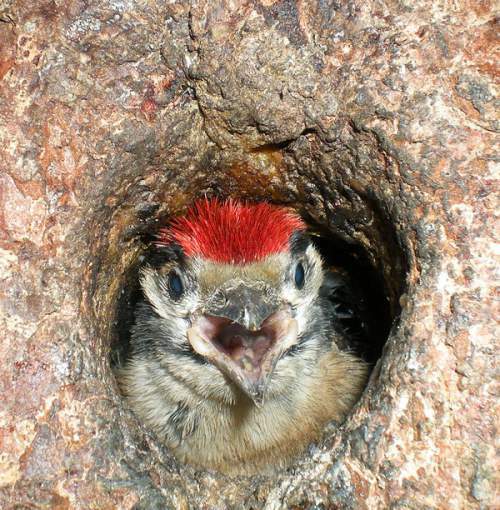 Habitat alteration and destruction, hunting and capture of adults and juveniles for pet-trade are the main threats that are endangering the survival of these woodpecker species. 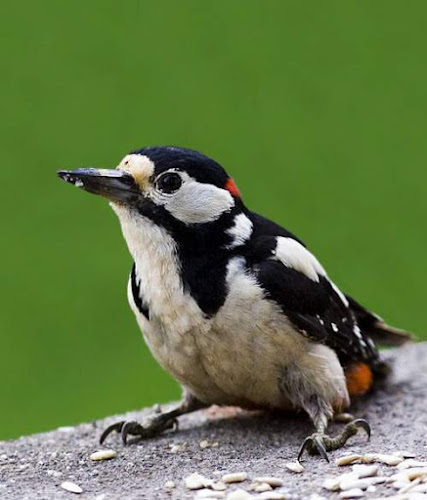 The great spotted woodpecker (Dendrocopos major) does not approach the thresholds for being Vulnerable, either under the range size criterion, or under the population trend criterion or under the population size criterion. The CITES (Convention on International Trade in Endangered Species of Wild Fauna and Flora) status is ‘Not Evaluated’ for the great spotted woodpecker (Dendrocopos major). The great spotted woodpecker (Dendrocopos major) is closely related to the Sind woodpecker (Dendrocopos assimilis), Syrian woodpecker (Dendrocopos syriacus), white-winged woodpecker (Dendrocopos leucopterus) and the Himalayan woodpecker (Dendrocopos himalayensis). The fourteen recognized subspecies of great spotted woodpecker (Dendrocopos major) are: D. m. major, D. m. cabanisi, D. m. brevirostris, D. m. stresemanni, D. m. kamtschaticus, D. m. japonicus, D. m. pinetorum, D. m. poelzami, D. m. hispanus, D. m. numidus, D. m. harterti, D. m. thanneri, D. m. canariensis and D. m. mauritanus. Current topic in Birds of India: Great spotted woodpecker - Dendrocopos major.